Big Red Car here. Wet day today, no running time which makes me feel listless and like a mediocre convertible — not the excellent, authentic All American car I am capable of being. Need a bath and a shine. 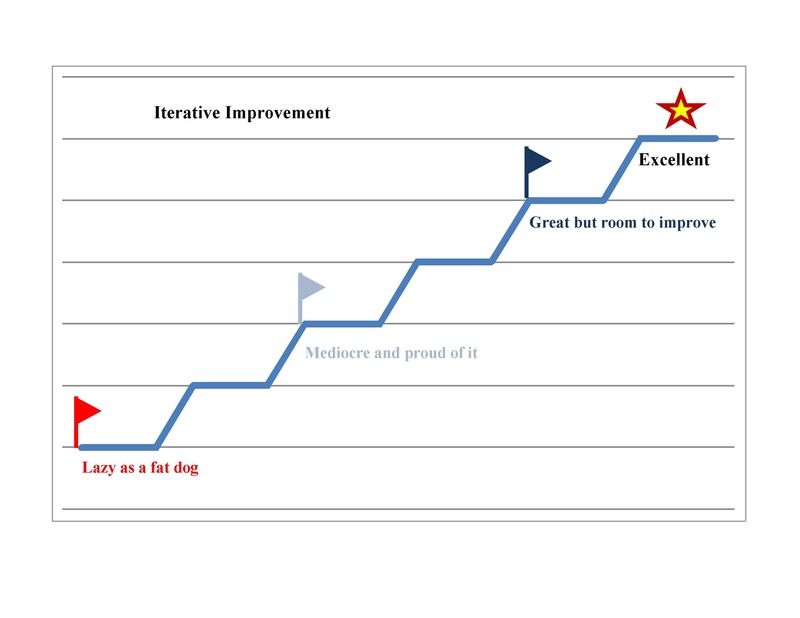 Which gets me to thinking about iterative improvement and the path to excellence. Nobody ever gets to excellence in one leap. You get there by a series of iterative changes. Do not despair even when you may go backwards once or twice. Just keep plugging away and working toward a new level of heightened performance. The relentless pursuit of EXCELLENCE — one iteration at a time. Be kind to yourself in your relentless pursuit of excellence. You WILL get there. Just keep plugging away. This entry was posted in Excellence and tagged excellence. Bookmark the permalink. Remember that 3:00 AM phone call? Thanks for these business posts. I left corporate america to help a friend start a company, and these posts have become invaluable. The “Checklist Manifesto” saved my sanity since I was the person who had to go from being an analyst/ bs artist to an operator who made sure the trains ran on time. Your advice was extremely helpful to making the transition. Glad I could help. The skill set to run a small business in which you are everything is both exciting and daunting. That is all I have done for the last 30 years and I have a huge library of exemplars. The Checklist Manifest — which appeals to me in particular because I am a pilot and thus intimately familiar with running checklists under pressure — is revealed truth. I frankly believe that the ability to reduce businesses to process charts and checklists is the first step in transforming old economy companies to new economy companies. I think this is where a lot of money is going to be made in the future and right now. Let me know if I can help on a one on one basis. I have quite a few clients on voomly.com which was founded by my friend, Andy Swan. I can be reached there at https://www.voomly.com/jeffreylminch. Give it a whirl and I will be glad to help. I obviously am not doing it to make a bunch of money but the website keeps my efforts very well organized.